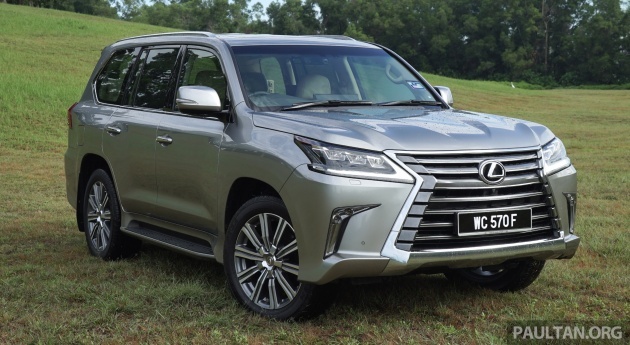 The Lexus LX570 has just received a significant price drop in Malaysia. Launched at RM923,960 in 2015, the flagship SUV now goes for RM850,000, a reduction of almost RM74k. Specs remain unchanged, so this is a genuine price drop, no caveats. If you’d like to know, it’s RM851,872.20 in Sabah and Sarawak, RM454,283.31 in Langkawi and RM 455,092.21 in Labuan. The third-generation J200 LX570 is in Malaysia in its latest facelift form, powered by a 3UR-FE 5.7 litre V8 engine, with 362 hp at 5,600 rpm and 530 Nm at 3,200 rpm. It’s paired with an AE80F eight-speed automatic transmission, together with a full-time all-wheel-drive driveline that includes two-speed transfer and variable fore-aft torque split via a Torsen limited-slip differential. It gets to 100 km/h in 7.7 seconds, on to 210 km/h. It gets full LED lighting on the outside, with massive 21-inch wheels to go with the equally gigantic spindle grille. Under the skin, it gets adaptive variable suspension (AVS), auto height control as well as crawl control. A Multi-Terrain Monitor offers an image display of areas around the vehicle when traveling at low speeds (up to 20 km/h), as well as an underfloor view. Highlights inside include the 19-speaker Mark Levinson Premium Surround System with 16 channels of amplification, and a Rear Seat Entertainment system with dual 11.6-inch screens for second row passengers. On the safety front, the LX570 comes equipped with ten airbags, all-speed active cruise control, blind spot monitor with rear cross traffic alert (plus reverse camera), lane departure warning and a tyre pressure monitoring system. Check out its specifications and equipment list on CarBase.my. So, what do you think of this, folks? Now it really afgorable …now all can buy a lexus…good job nowone buying myvees anymore..
What a sinful thing to see Langkawi RM450k but we Malaysians pay RM850k for the car. Malaysians cannot go on like this ie having the highest car prices in the world. Not referring to this car but cars that are mainstream to the public, half the price is on taxes. No logic. We Malaysians are still waiting for the 30% car price reduction promised to the rakyat 5 years ago. Bear in mind, even with the 30% discount (if it is given) car prices will still be very expensive for most Malaysians. Remember, official statistics by EPF themselves, 76.3% of ALL their contributors earn RM1500 and below. That is how low Malaysians earn. Time for car prices to come down. I have seen so many LX570 with Wilayah registrations plates having Sabah Sarawak road tax. How sinful. Rich people supposed to pay RM18,000 in road tax but pay RM3000 instead. That is just one person. Calculate that with the berpuluh puluh cars in Semenanjung using such fake road tax. JPJ oh JPJ…..when are you going to curb this major big problem? LHDN is being deprived of hundreds of million ringgit or BILLIONS in revenue per year from road tax cheats in Semenanjung. LX 570 road tax for peninsular malaysia is RM5900.80 instead of RM18k because SUV body has cheaper road tax. Thanks for clearing up on his fake news, bos man! U da bos! The calc is there for u. Dun be lazy asking to be spoonfed. Gomen owned UMW which owns Lexus only reduce prices of cars RM850k. They help the rich get richer. The poor people who only can buy Vios and Perodua….They don’t reduce. UMW owns Perodua. Syabas Sel Gov helps the poor by giving better public transport. And its free! Smart Selangorku! Harga kereta mahal, marah kerajaan. Harga kereta turun, complaint hilang RV, kenapa tak puji kerajaan? Typical boring sales man comment from the empty FA showroom. Is this car better than the Range Rover Vogue? But bigger engine. Land cruiser: 4.7L. LX: 5.7L. Thats the power of consumer. When nobody buys then they will lower the prices to compete. Im still waiting for them to gip RM74k diskaun on vios cuz that junks only real worth is RM4k as scrap metal. Pay so much for the car, but cut through wind like a piece of brick…..
No way I will buy this over priced Japanese metal piece. Not worth at all!